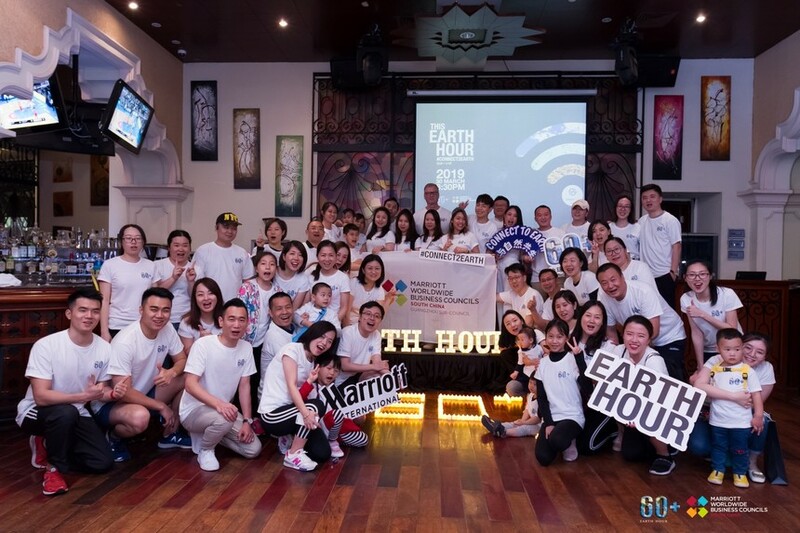 GUANGZHOU, March 30, 2019 – 10 Marriott International hotels in Guangzhou area will go dark for one hour on March 30th to shine a light on climate action in support of Earth Hour 2019. The hotel will join millions around the world in turning off its lights at 8:30 p.m. local time to illuminate a powerful message about environmental awareness and action. The World Wildlife Fund (WWF) created the annual global environmental awareness event 12 years ago to emphasize the threat of climate change. The Westin Guangzhou, The Westin Pazhou, The Ritz-Carlton, Guangzhou, Sheraton Guangzhou Hotel, W Guangzhou, Aloft Guangzhou Tianhe, Guangzhou Marriott Hotel Tianhe, Sheraton Guangzhou Nansha Hotel, Four Points by Sheraton Guangzhou, Dongpu and Aloft Guangzhou University Park participated with a numbers of activities, which include: turn off exterior signage lighting; dim or turn off non-essential interior lighting; use candlelight in appropriate public areas such as restaurants and bars; use in-room voicemail messages and in-room television messages to inform guests about Earth Hour observances; and joining the themed activity that hosted by The Westin Guangzhou. FOODS at The Ritz-Carlton, Guangzhou will also offer fresh salad and Earth Hour themed desserts, and The Churchill Bar prepared nature-themed cocktail. Several guests also joined the Earth Hour Themed Activity held at FOODS by French brand Scent Chant, blending personalized fragrance with natural ingredients. Under the theme of #CONNECT2EARTH, The Westin Guangzhou switched off the light to embrace the nature, and arranged Healthy Run at Tianhe Stadium with the associates, guests and medias of 10 Marriott International hotels in Guangzhou area. Also Aloft Guangzhou University Park hosted unplugged music concert at Wxyz bar and recycling paper origami at lobby. Aloft Guangzhou Tianhe hosted a Starry Sky themed cocktail event at Re:fuel. The Westin Pazhou had themed cocktail event and healthy Samba dance at the lobby.